Live streaming was made possible by the voluntary help of John Murphy, Director of Hawk IT Services Pty Ltd who was assisted by Ryan Leahy. Ryan recently presented on the "Torres Strait Pigeon in Capity" at our April 2014 meeting and a visit to one of his favourite zoos in 2013, the St Lois Zoo in Missouri in the USA (in particular the St Lois Zoo Bird House), at our August 2014 meeting. Welcome to the General Meeting of the Avicultural Society of NSW. Tonight I would especially like to welcome all those thousands of people throughout the world who are sharing our live stream. Welcome to you all. The Avicultural Society of NSW is in its 75th year – its Diamond Jubilee Year – and as part of that we have decided to totally open the club up and have live streaming involving you. Because it is a live stream, you are welcome and indeed invited to be part of it. You may tweet your comments to the Society's twitter which is @AvicultureNSW or you may simply click on the live chat itself and Ryan will pick up your questions. So you can definitely be part of the audience. Tonight (and it is an exciting night) we are going to be having Daniel Gowland from the Priam Psittaculture Centre who is going to be talking to us on the topic of Avian Importation. Then because of Priam's work on the Orange-bellied parrot, Daniel is going to give us a little update on the work that's been done at Priam (and is being done at the moment). It's highly significant for this incredibly threatened bird. There are only 70 to 80 of these parrots living in the wild at the moment and a captive population of 350, so we will be going into that a little bit after the Avian Importation. Daniel has got great credentials for this because for those of you that have been lucky enough to visit Priam (which is at Bungendore just outside of Canberra) you will know that it's got one of the greatest collections of foreign parrots in the main, but quite a lot of large Australian parrots; Black Cockatoos and the like. Their technology is just amazing. Daniel is an aviculturist of long standing as is his father Peter who is well known to most of the older members. 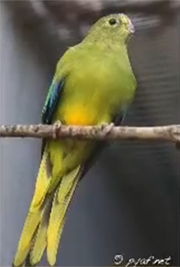 He is a member of the Orange-bellied Parrot Captive Management Group and has been for some years. His contribution to that I'd say is pretty extreme, because he is presenting information that is absolutely beautiful, new information which he will talk about. The Society's position on avian importation is that we are in support of both importation and exportation of birds so long as they derive from captive self sustaining populations, for those where importation or exportation would likely become so. So we are not in support of wild bird traffic, we need you all throughout the world to know that, we are definitely anti-smuggling and in support of legal trade in birds. It's been a vexed issue in our area because it's just basally slow to get real movement on the topic. Daniel will be providing some ideas tonight about what our forward progress needs to be on that topic. So Daniel welcome to the Avicultural Society of NSW. Graeme Phipps: The Orange-bellied parrot is named Neophema chrysogaster. This little Neophema is a little grass parrot which is not to much different in size to a large Budgerigar. It is very, very threatened indeed with a population of 70 to 80 in the wild and a captive population of 350. The private avicultural community has only reasonably recently been invited into the programme in any significant way. Daniel is a member of the captive management group, as am I. Daniel would you like to talk about some of the work that Priam is doing as part of the Orange-bellied Parrot Captive Management Group and the Recovery Programme? Thank you Graeme and thank you guys. This will be precise and please feel free to throw in any questions you need to. This is the male Orange-bellied parrot, a much brighter little individual, a small little guy, about 30-40 grams when fully mature. The benefits that Australian aviculturists can give to this programme are beyond words. The things that aviculturists do for the love of these birds take it away from the past. There are technologies; and when I say technologies, I don't mean they have to be electrons. It is just the advancement in our thinking; with dietaries, the basic husbandry; that leaves behind some of the notations of the "old school" ways. It drives it forwards. Orange-bellied parrots are one of the key enigmas of Australian political nightmares because they've been around for ages. What we are doing is we are just taking everything we learn from you guys, everything we learn from aviculturists. We're doing things like putting the animals in suspended aviaries. I know I had an issue with suspended aviaries when I first started getting full on into this sort of a lifestyle, but I do see the benefits of it. The same thing as when you have got a surplus number of females; putting two females in with the male and then having two females breed as opposed to having one separate put aside. We're looking at the eggs; looking at what comes out of them; diversifying their diet, like pellets which is basically grain which has been mashed up into a easy packaged form that we have known consistencies of proteins, carbohydrates, fats and iron and whatever. It has been a really long process to be a part of this programme. So I really want to make sure that we don't do anything which is going to jeopardise aviculturists and the role that they are going to play. In taking what we've learned from aviculture we've also done little things. We've used multiple nest boxes with a lot of interaction which is demonstrating how much we can use these guys. We've used double clutches; how much we can actually ask of these guys? In nature there's a lot more stress. I think a lot of the time in nature, people think it's romantic and it's in the wild, but it's a lot of work. You've got to get food every day, you've got to find shelter every day, you've got to find a mate, you've got to find a nest box or a nesting area and you've got to defend that. In aviculture we tend to put them in an enclosure which is protecting them from the outside world. It is not necessarily just any enclosure; we've got to find the right enclosure for the right pair. We have interaction with the parent birds, on eggs, raring young, that we can go in and have a look at. Conditioning them so that we can go in and inspect them and see how they're growing and learning from that, and take that back to our nurseries. By double clutching; which is a simple thing that happens in nature when a possum or a reptile, a flood or a hot spell, would actually cause a clutch to be lost, but they've got time to have another one; for a threatened species, we can almost double the output without jeopardising a loss a loss. Two clutches is great. It is something that if we are feeding the critters right and we're monitoring them, we can actually tell if we're doing something out of the ordinary. Double clutching isn't something which is new. Likewise, feeding a diverse diet; sprouting seed; having a whole range of native flora and fauna. We are lucky where we are because we are 840 to 850 metres above sea level so it's kind of cold up there; which is similar to where they are down in southwest Tasmania where their main breeding area is. We've got some of the same shrubbery around which we can also feed to them to actually help build them up in time to breed. We really like to look at eggs. We figure there are a few things we can do to assess the wellbeing of the critter. We can take swabs and we can collect some of their faeces, we can take blood and wot not, and we can feel the condition of them; but if we look at the eggs you can get a lot about the diet; you get a lot about the fertility, you get a lot about the compatibility of the two individuals, you can start to see where growth comes from. We also use another science. In many of the breeding programmes they have an algorithm which gives you a "mean kinship". Mean kinship is a number that represents how that individual is related to the rest of the population. That's one great science; the same way that genetics is another great science. Biology is another great science. I personally would find it very bad it I just focused on biology and whatever I got from my report from biology. That would be wrong. Biology doesn't have all of the answers neither does any of the disciplines. So it is something that the more that we can put together the more that we can actually have a critter that has this fitness that will help it to survive out in the wild. If any animal we have in our care is spoilt; it's something that we need to take seriously because we can over spoil critters. When they get out into the big bad world they've got to learn how to work with a flock, they've got to learn how to fly at 150 metres flat chat and lose a predator and land. There's endurance, there's fitness, there's a knowhow, that these guys have to get inside their heads and we have to protect them from that in many ways. We are writing up everything that we do and we are putting it on our website. There's a write up for this season ('Instincts', Daniel L Gowland, Lisa Crawley) and it is planned that we will have a write up on our website after every season. What is the genetic pool like in captivity? Originally I think it comes from about four to six critters and then a few years ago they brought in about 19 wild animals that they put into the breeding programmes. If you look at the records, the breeding programme with the 19 that they put in there, the breeding went up a hell of a lot. So I would say 25, definitely fewer than 30 individuals over the lifespan of the programme. The programme has been going for about 25 years or more. At what point do you start releasing the birds back into the wild or have you already started that? They have been releasing the parrots back into the wild for some time. I think they put out 30 this year and again it's something that I think we can help with. Out of the 20 that were released, only five survived. There has been breeding in the wild I think of captive bred birds, so it is hitting, but the programme has to work on increasing the fitness of the birds that are being released. We can come up with the numbers and if there was more private involvement obviously we could come up with big numbers. However, the numbers by themselves aren't enough; you've got to increase the fitness. Yes, for conditioning for the wild life, for living out in a completely different area. We are talking southwest Tasmania. Taroona Wildlife Research Centre is near Hobart; you've got Healesville Sanctuary which is down in Victoria; Moonlit Sanctuary in Adelaide; and us near Canberra that have these critters in a completely different environment. Air patterns are completely different, predators are completely different, let alone getting that flock mentality. I think that it is one of the key things that we need to work on. Personally I think we need to be able to get large enclosures where these guys can learn to work as a flock and need to get some predators. Get them to know how a hawk flies and how any other bird of prey works or even ground animals, how they work, plus slowly get them into it. You can bring an animal into your facility and it can take two, three, four days sometimes for the animal to adjust to the local area in the sense of just getting food; let alone going okay with everything else. It can take two years when you move a bird that has been in the facility for years and years, when you move them to another flight, they go "oh, this is a bit different!" So I think that there is an adjustment timeframe and I also think we need to be a little bit gentler in the way that we actually let these guys go from one area to another. I think we need to have some larger markets but we're going into a topic that will go on for a long time. Our member Ravi Wasson the bird trainer has worked with a group of a dozen Elegant parrots that he got from Daryl Gray. Daryl is one of the greatest Neophema aviculturists that there is. Ravi worked with Elegant parrots as liberty birds. He has flocked them like you were just talking about Daniel and he has done it in the presence of two species of predatory peregrines and goshawks. Those are the sorts of things that need doing. I take the view that if we know what the problems are, invite us in we can help. There is another problem that has just recently come to light and that is that the birds can lose nests due to predation by sugar gliders and also they can get kicked out by competitors like starlings. Now we can help with that. We can design nest boxes that will exclude sugar gliders and may also be not so useful for starlings. It is in much the same way as the captive work with the Gouldian finch. It led to the design of a nest box that could be used in the wild that long-tail finches couldn't use, because the long-tail finches were taking the nest of the Gouldians. There are limitless contributions that the brains of private aviculturists can come up with. Do you see any benefit from involvement of zoos or are private aviculturists the better direction ahead? I think you need the collaboration of both. The zoos have been asked for positions (as far as I'm aware) and it has come back that they've filled all the zoo positions that are available. There's been a target set for the total number of animals they require in a managed captive environment and we still haven't met that yet. I also see private aviculturists as being able to fill that to spread the animals wider. The private aviculturist I see at the moment is where the necessary step is for it to go. Only because there is nothing left in the zoo world. There is an online question from Murray Macpherson who asks "what is the current fertility rate of captive birds?" A really good question. I couldn't tell you off the top of my head. I know that it has been recorded in our write up that we have a "mean kinship" of a particular value. It will be on our website but I can't tell you that at the moment, I'm sorry. Hannah1978 asks "should there be an aviary on the release sites of Orange-bellied parrots to help the parrots adjust to the surroundings in the weeks before their release? Sort of like a soft release?" There are aviaries down there for them. My understanding of them is that they aren't large enough to enable large flocking behaviour, or the fitness level that is required to have that endurance, or for when a predator comes and to be able to learn how to work out with what. So there is something down there at the moment. What size dimensions are these aviaries that you are talking about? I haven't seen it but I've been told that they are about 2m to 3m wide x 4m to 5m long and I think I am being generous with those numbers. What do you think is desirable? I think height, the natural instinct is to go up, and we need wide. I don't think we necessarily need to have the classic super structure. We need to have something that is almost tunnelling. There is no reason why we couldn't have something as wide as 4m to 5m but then go for a length that is a big sort of a snake sort of a field and ideally, an oval, or a big figure eight even. Do you think it might be achievable with recycling, say horticultural greenhouse structures and rewiring? I think the netting you use to put over fruit trees and I think the poly piping that you use to put 50m tube in and a couple of star pickets plus you could double them, so I think let's brainstorm it and let's get some builders in there as well. We've got to fly it in, southwest Tasmania, you want to walk into it there; it takes about seven days of hard slogging. You are not going to walk bits in. You've got to fit it into a plane, that's the other thing to get it in there. Ideally I think we need to have a structure which is a shape that we can see from a distance and we can put on the mainland too. Because when these little knuckleheads get from down south of Tassie all the way over to Victoria, by then they are going to want to feed and they're going to want a break. If we can put them into these enclosures and we can actually get them acclimatised to that shape and that space, pulling out the door so they can come in and out and feed freely, they can go and they see this from the air when they land in Victoria. They're going to see the same sort of shape, the same sort structure, if you do need to close it down. One more question Daniel. Why have the numbers declined? Is it the environment? Is there a lack of logs? Is there a lack of food? Because I can't see the point in releasing lots more birds if the environment can't support them. The question is why are they declining? I have no idea and I don't think they know why they are declining. There are theories but I don't believe there is a definite reason why they are declining. Whether it's diet or whether it's habitat? I think that Paul's question is on the hammer. We didn't know why Murray fowl were declining either. What the zoo did was breed Murray fowl for 10 years and the wildlife agency released them in four coverts each year. They studied them to find out why they didn't thrive. I think it is extremely sad that 35 years into the Orange-bellied parrot project and we still don't know the answer to this question. As far as husbandry is concerned, how different are they from other Neophemas? I really don't believe that they are really that different but you would have to go to someone who has been breeding them for decades. I don't see that they are that much different at all. Well Daniel that was just wonderful. I am so admiring of the work that you're doing at Priam and thank you extremely for your generosity in driving up from Bungendore. Thank you ever so much for coming up and thank you to John Murray and Ryan Leahy for setting up the live feed.